Have you heard? The ghastly, horrifying news that there is a national shortage of Easter Eggs? I'm not joking; we need to start a petition to ensure the Chief Logistics Officer of Britain's major supermarkets receives a formal written warning for gross misconduct. The minute I heard this, I sped in my slippers to perform what can only be described as a 'supermarket sweep' of the aisles at my local store of all remaining Easter Eggs. Yes, the national shortage has been made considerably worse by my greed. Anyway, to the cake. 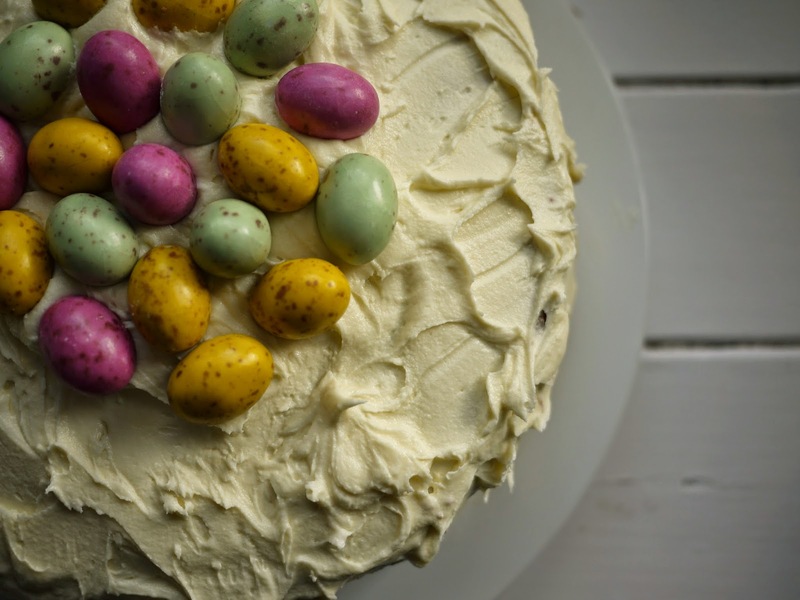 This cake should have had roughly double the number of chocolate eggs that have been artistically (ahem) placed as decoration. But there was absolutely no way a pack of chocolate eggs could lay, untouched and undisturbed, at our place for more than about seven and a half minutes. 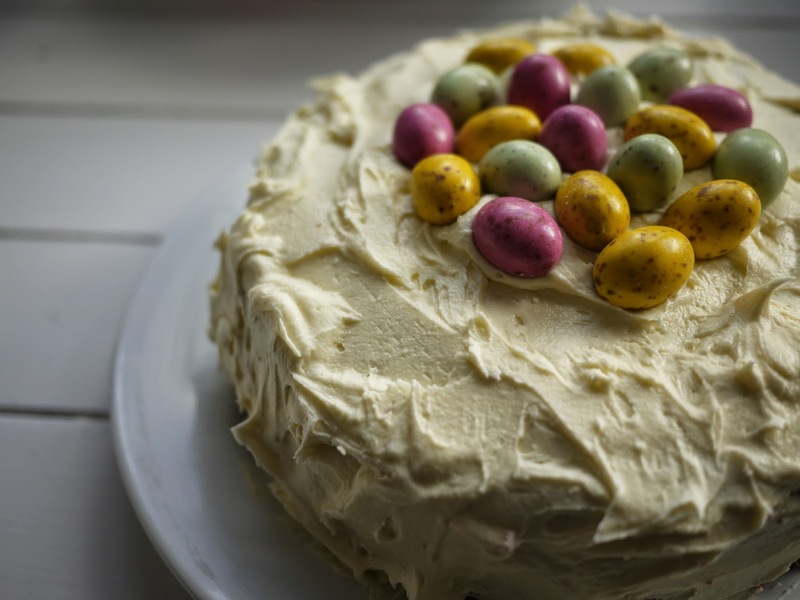 This is a rather decadent centrepiece for the Easter table: a light, fluffy sponge sandwiched together with a zesty lemon curd and smothered in a sweet white chocolate icing. 1. Preheat the oven to 190C/170C fan/Gas Mark 5. Grease and line two 20cm sandwich tines. 3. Divide the mixture between the two tins, smooth over the top and bake for twenty minutes or until golden and springy to touch. Allow to cool in the tins for five minutes then turn out to a cooling rack. 4. To make the icing: beat together the chocolate, butter and icing sugar until you have a nice smooth icing. The cakes themselves can be frozen for up to six months. Freeze separately in either a well sealed polythene bag or rigid airtight container. These Mini Eggs are from M&S. The best mini eggs on the market. Believe me, I've tasted the lot. I adore lemon curd, although I buy it ready made. My only attempt to make my own was a complete failure - but that was at school in 1962 when I was only twelve! I love white chocolate icing too. Yum! Thank you Jean! My brother and sister in law once made 140 small jars as wedding gifts for their guests.... I don't think they've been anywhere near lemon curd since! So pretty for Easter, I agree with the M&S eggs - they look better than a lot of other types of mini eggs. Happy Easter! Absolutely- I can't just buy one packet in M&S! Sounds and looks yummy, lemon curd is getting very popular at the moment. Surprised to hear about the national shortage, I saw plenty of eggs in the shops yesterday. I think the shortage might be caused by me - I seem to have bought many this year (for me, not gifts)! And me! Our recycling bin is full of Easter egg cardboard boxes! 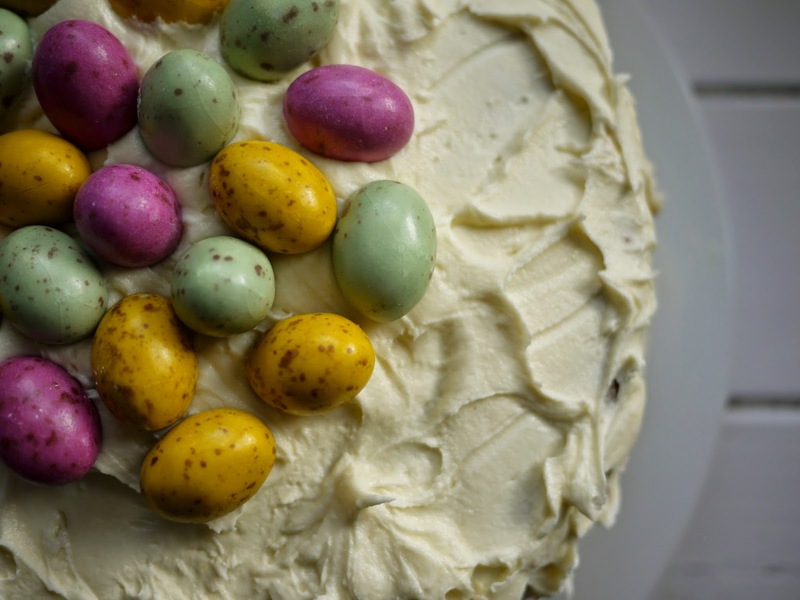 It's like you've combined by favourite things in life, Kate - white chocolate, lemon and mini eggs! I might just have to make this! Phew! Easter would not have been the same without a packet or two! Oh this looks like a sure winner - perfectly decorated for Easter. We had a shortage downunder too everyone I spoke to said "What's happened to all the Easter Eggs this year?" Hope its not going along the same trend as Father Christmas!!! Missing in Action in a lot of shops last year.